Alcatraz is an island in San Francisco Bay, near San Francisco, California. Historically, the island was used a fortress, and later as a maximum security prison, but today is a historic site managed by the National Park Service. 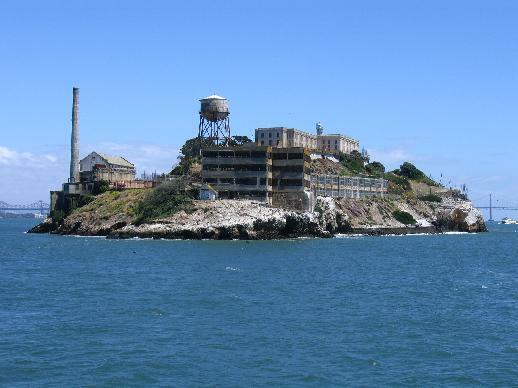 The island has featured as a location in numerous films including Birdman of Alcatraz, Escape from Alcatraz, The Enforcer, X-Men: The Last Stand and The Rock. As one of America’s most notorious prisons, Alcatraz has been a significant part of California’s history for over 155 years. The small, lonely rock, known in sea charts by its Spanish name “Isla de los Alcatraces,” or “Island of Pelicans,” lay essentially dormant until the 1850s, when the military converted the island into a fortress to protect the booming San Francisco region. Alcatraz served as a pivotal military position until the early 20th century and in 1934 was converted into a federal penitentiary to house some of America’s most incorrigible prisoners. The penitentiary closed in 1963, and Alcatraz joined the National Park Service system in 1972. Since then, it has remained a popular attraction as part of the Golden Gate National Recreation Area. What's more exciting than a prison break? Frank Morris and John and Clarence Anglin escaped from Alcatraz in 1962 and have never been caught. Many authorities are certain they died crossing San Francisco Bay. Relatives claim they made it to Brazil. The theories of what happened to them are endless. Find out the facts from people who dealt with the men and the case first-hand. This is one mystery you'll definitely want to solve. Alcatraz - A Definitive History of the Penitentiary Years is a comprehensive reference with hundreds of pages of historic photographs, documents, and information that breaks away from traditional tourist style books. This book is the result of years of intensive research, and navigates the Island's history through rarely seen documents, interviews, and historic photographs. Historian Michael Esslinger thoroughly details the prominent events, inmates, and life inside the most infamous prison in American History. His research included hundreds of hours examining actual Alcatraz inmate files (including rare original documents from Al Capone, Machine Gun Kelly, and over a hundred others) exploring the prison grounds from the rooftop to the waterfront to help retrace events, escape routes, in addition to conducting various interviews with former inmates & guards. His study has resulted in detailed accounts of both the 1946 & 1962 Escape attempts. A definitive account of the 1962 escape of Frank Morris and the Anglin Brothers provides rare insight extracted through photos, and over 1,700 pages of FBI investigative notes. Detailed narratives of Alcatraz's most notable inmates who include Robert Stroud (Birdman of Alcatraz), Al Capone, Machine Gun Kelly, Frank Morris, the Anglin Brothers, Doc Barker, Joe Cretzer, Bernard Coy, Miran Thompson, Sam Shockley, and many-many others. Alcatraz Federal Prison - A Definitive History of the Penitentiary Years, is a comprehensive reference on the history of Alcatraz and contains one of the most comprehensive archives of inmate and prison life photographs (nearly 1,000) from 1934-1963. Despite their place in popular culture, jail breaks are an incredibly daring prospect for any criminal to undertake. In most countries, escaping from jail is a very serious offence and will certainly result in a harsher punishment once the subject has been re-captured. Depending on the severity of the crime for which the offender was originally imprisoned, an attempted jail break can result in a significantly longer sentence. The cases covered in this volume are a combination of those prisoners who went to extreme lengths in order to free themselves from the confines of jail, those who broke free as a declaration of their innocence, and those who simply pounded at the first opportunity to escape. The fascination of each case cannot be over-stated, as well as the unimaginable bravery and audacity each one required. Jim Quillen, AZ586—a runaway, problem child, and petty thief—was jailed several times before his 20th birthday. In August 1942, after escaping from San Quentin, he was arrested on the run and sentenced to 45 years in prison, and later transferred to Alcatraz. This is the true story of life inside America's most notorious prison—from terrifying times in solitary confinement to daily encounters with "the Birdman," and what really happened during the desperate and deadly 1946 escape attempt. This is a true account of life in Alcatraz prison written by William G. Baker 1259AZ, a former prisoner of Alcatraz. This is how we lived, what we thought and said and did, the good and the bad. This is the true story of Alcatraz. Escape from the ordinary and break into Alcatraz, America's most famous prison! Legendary literary game-maker Garrison Griswold is back in action―this time with “Unlock the Rock.” For his latest game, Griswold has partnered with the famous--and famously reclusive--mystery writer Errol Roy to plan an epic escape room challenge on Alcatraz Island. When prisoners boarded the boat for Alcatraz, they knew that they had reached the end of the line. Not only was this the toughest of all Federal penitentiaries, but it was also said to be virtually escape-proof. The island was a natural fortress, separated from the mainland by a narrow strait of freezing water and deadly currents. This prison was the U.S. government’s drastic answer to the lawlessness unleashed under Prohibition, which continued throughout the “Roaring Twenties” and into the teeth of the Great Depression. Alcatraz, with its damp cold and austere isolation, its rigid discipline and strict rule of silence, was as tough as the criminals that were sent there, and by the time the prison closed down in 1963, "the Rock" had indisputably done its job. The book includes narratives of Alcatraz's most notable inmates who include Robert Stroud (Birdman of Alcatraz), Al Capone, Machine Gun Kelly, Frank Morris, the Anglin Brothers, Doc Barker, Joe Cretzer, Bernard Coy, Miran Thompson, Sam Shockley, among others.